A twist on a brunch time classic. With crumpets coming in hot as a 2019 food trend, they replace the original breakfast muffin perfectly and along with the blanched asparagus, you can’t go wrong. To make the hollandaise, melt the butter in a small sauce pan and skim off any white solids that float to the surface, leave on a low heat. In a heatproof bowl whisk the two eggs yolks and white wine vinegar until smooth. Bring a small pan of water to a simmer and sit the bowl containing the egg mixture over the pan to create a bain-marie. Very slowly while continuing to whisk the egg mixture, pour the melted butter in bit by bit. Continue until you have a creamy smooth hollandaise. If the mix starts to get too hot lift the bowl off the heat and continue to whisk. Squeeze in the juice of half a lemon and season to taste. To keep warm until ready to serve. Bring a shallow wide pan of water to a simmer then add the asparagus to blanch for 2-3 minutes then set aside. Crack your 4 eggs into 4 separate ramekins, gently lower each ramekin into the simmering water and tip the egg into the pan. Simmer for 4-5 minutes. Whilst your eggs are cooking toast your crumpets. To assemble, divide the toasted crumpets between 4 plates. 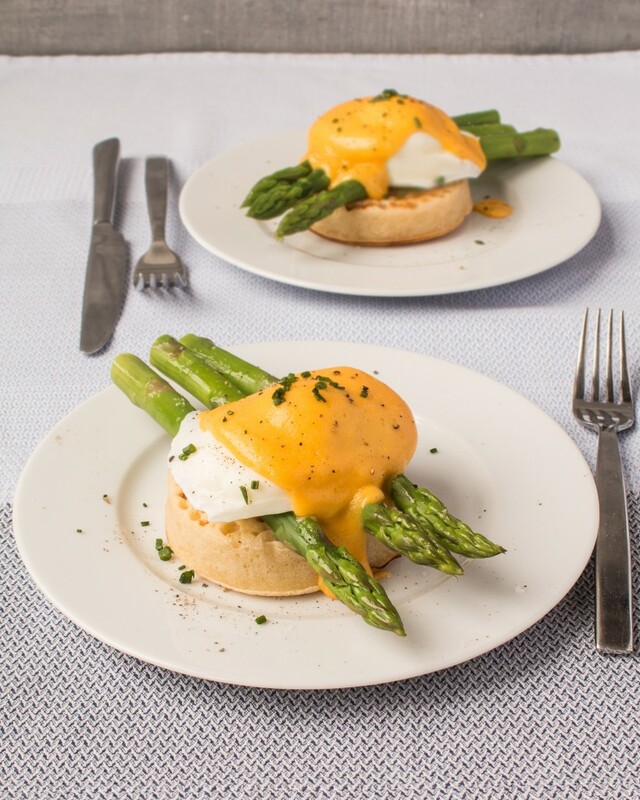 Top with asparagus, poached egg and a serving of warm hollandaise. If using sprinkle over some chopped chives.